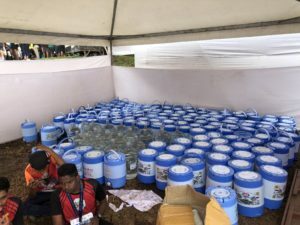 The worldwide concern over single use plastic is a spiralling issue that has long been acknowledged by runners, but presents race organisers with challenges in terms of practical and viable solutions. In working on, or having the opportunity to attend, events around the world, I have seen changes in recent years, and there is a general exponential increase in attempts to reduce the carbon footprint, recycling and reduction in paper and plastic. The solutions used in one country, or culture may not of course work in another. These all reduce the plastic use, but what of tree and carbon foot print of manufacture? 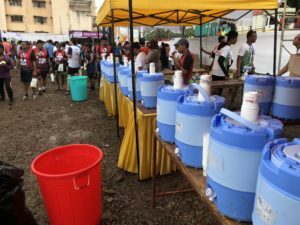 At the finish the drinks are provided in a separate area where runners can pour their own water from large plastic ‘cool-box’ type storage kegs, and the drink sponsor provides their rehydration in small block Tetra Packs which can be recycled. The culture means that this can be in the open as people understand, and respect that, the resources are for the runners and not the supporters. Would such a system work in South Africa? Possibly as long as the fenced off section was long enough after the finish line to prevent a backup of runners across the finish line. 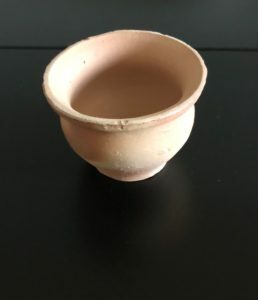 In the Chembur 10km held in Mumbai India, the organisers took a step further by manufacturing small unglazed clay bowls for water ‘cups.’ These of course are completely recyclable, but only truly works for small numbers, and were less practical for the elite runners. (see photo). 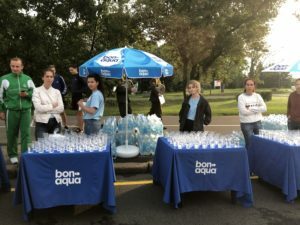 Worldwide the challenge exists to solve the water table solution: How to provide each runner with around 150-200ml of water at regular intervals of 1.5 to 5k depending on humidity, heat, and prevailing culture. The IAAF rules do not allow for the distances to be longer, and the fact is that exertion initiated heat stroke is the biggest medical challenge in the vast majority of mass participation events. Currently the ‘favoured’ option is to provide 350-500ml bottles at those regular intervals. Even in temperate London it is every 1.6km with an additional Lucozade spots for energy. That’s about 1.2 million bottles, but most importantly its around 1.2 million small plastic caps! It is the caps from bottles that tend to escape the clean team. In Minsk, in Belarus, 5 tractor trailer combinations lined up with 4 street clean and brush machines 30 minutes after prize giving and toured the streets as an army of clean team moved into the start / finish area. 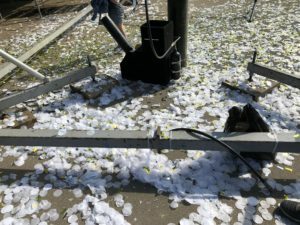 Three hours later there was little to be seen and those few remaining bits of celebratory confetti shot into the air were uncovered and removed by the daily clean squad in what is a spotless city. The major advantage of a city marathon is the hard surfaces, that make collection easy, and this is also assisted by a culture that endemically scorns litter. The challenges in rural and developing countries is harder, as only hand picking works for bottles, cup, sachets and elusive tops in rough grass or veldt. But its not only refreshment tables: The “Greening” commences with registration where on-line entries are an ideal means of reducing the carbon costs, and can save a fortune of trees. 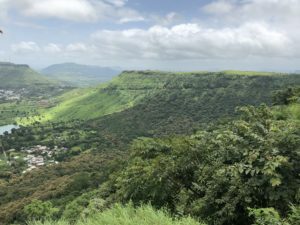 In Satara Hills 21k the 6000 entries last 3 hours! (Indian running is going to be very big soon). As with Two Oceans half, Satara Hills, has no real reason for printing an entry form, other than to ensure the opportunity exists for all. Entries for London, New York, Mumbai etc focus on the digital mechanisms, but even they have a portion of manual hard print materials. Not surprisingly the printed option is greater in less developed regions such as Middle East, Africa, India and others. However they do not lack innovation or the will power to make their contribution. 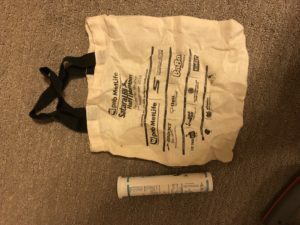 For instance the ‘goodie bag’ is moving from sponsors plastic bag, to a recyclable tog bag that can be used for shopping and other future purposes. 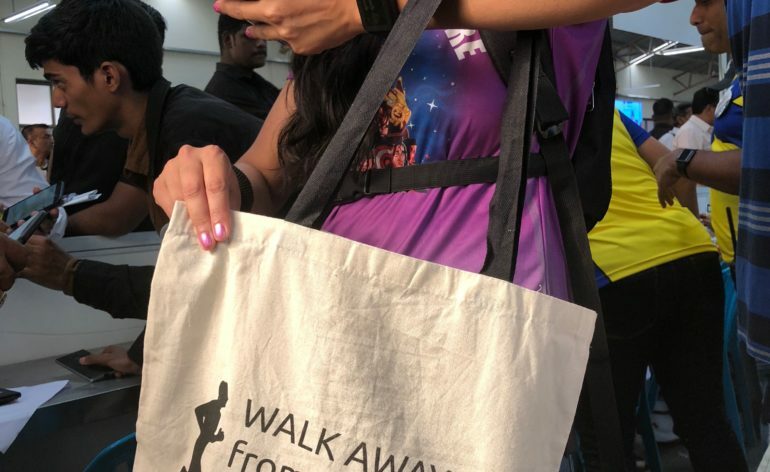 Even the nylon ‘shoe bag’ is being replaced. These new bags frequently carries a motivating green awareness slogan .. reminding runners of the overall objective. 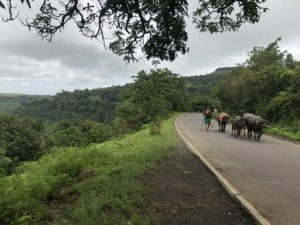 In Indian races have a tradition of providing post-race breakfast, which in Satara came in another small ‘collectable’ recycled multi-purpose bag. 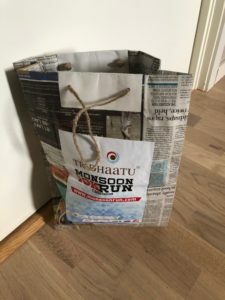 The Chembur 10km went one better with the goodie bag, having it constructed and bought from newspaper by underprivileged communities. This hit the spot in so many ways it will be adopted for the 2019 Navi Mumbai Half Marathon with 9000 runners. Greening has become an important point on the Race Organisers list and in Road running world-wide. AIMS (Association of International Marathons and Distance races) issued their 5th version of The AIMS Green CD in June this year, with new and greater concepts, recommendations, and checklists, and the IAAF were amongst the first signatures to the sporting worlds commitment to green procedures. 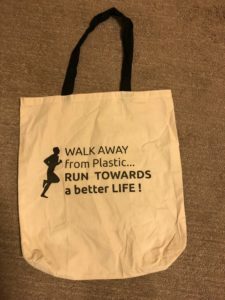 There are a myriad of ways that organisers can impact on the reduced use of plastic, paper and the environment, and because of the high public profile of road running it will be a target in every community. However, the greatest contribution that running can make is the much needed change in attitude and culture towards littering, waste management and use of single use plastics. The supporters of trail running, canoeing, or MTB who go in search of ‘nature’ are often amongst the most vociferous complainants of road running: yet its not unusual for them to be arriving or transporting their equipment in large SUV, or travel with less than full vehicles: One “trail-running green warrior” in a large 4×4 could easily be considered as hypocrisy! 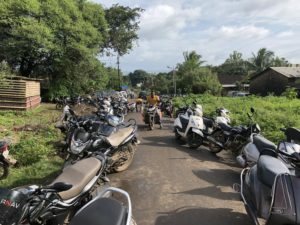 Transport takes on a different face in India where 250cc and below dominate the parking, or in Estonia where they provide a ‘bicycle’ marquee with racks for the locals coming to the race weekend! The point is that Greening is not an event, it’s not an action, it’s an attitude and culture and that is the power of a road race – reaching a mass of people and changing their attitude and awareness not simply of alternatives, but equally important of what to do with waste when there is not viable or practical alternative. By one simple example: it is estimated that there are 3.73 Billion airline passengers in the world each year. It is probable that each passenger will be given a single use, knife fork and 2 spoon, plus a plastic bottle, at least once in a flight. Yes there is more control over the waste management, but the fact is that the real impact of mass events is the lessons, the attitudes and the message and actions we take away and use in the future….. We all need to be part of it.